Antalya, Turkey, 13 November 2015 (from left) - Tunc Uyanik, CEO of the World SME Forum; Rifat Hisasrciklioglu, President of The Union of Chambers and Commodity Exchanges of Turkey (TOBB); OECD Secretary-General Angel Gurría and ICC General Secretary John Danilovich at the WSF-OECD MOU Signing Ceremony within the World SME Forum Conference. It is a pleasure to sign a Memorandum of Understanding between the OECD and the World SME Forum (WSF). This is the upshot of a fruitful conversation I first had with former Deputy Prime Minister Babacan, when we jointly launched the 2015 OECD Financing SMEs Scoreboard, in April this year, in the margins of the G20 Finance Ministers meeting in Washington. He then invited the OECD to be an “honorary member” of the WSF. I am glad to see that the OECD will be even more than that, and thanks to this Memorandum of Understanding, will become a full-fledged “institutional” partner of the World SME Forum, in the context of a concrete, substantive, policy cooperation. It has been a privilege for the OECD to contribute to the work of the B20 this year, through its “SME and Entrepreneurship” and “Financing Growth” task forces, among others, and by joining forces for the policy discussions on SMEs, including at our headquarters in Paris. We welcome the progress made and look forward to continuing to collaborate with you, the B20 and the WSF, under the Chinese Presidency in 2016 to achieve our collective ambitions in the area of SMEs. Let me also commend the Turkish Presidency of the G20, for putting SMEs development, financing and participation in global value chains at the top of its agenda and for mainstreaming SMEs-related issues across the various workstreams of the G20. We at the OECD, are proud to have contributed actively to this important priority of the Turkish Presidency, including through the crafting of SMEs Financing Principles which were endorsed by G20 Finance Ministers a couple of months ago in Ankara. We also updated our OECD Corporate Governance Principles, which have become G20/OECD Principles after their endorsement by G20 Finance Ministers earlier this year, and, as per G20 Finance Ministers’ request, looked specifically at their implementation in SMEs. Last, but not least, we delivered, jointly with the WBG, a report to the G20 Trade Ministers on “Inclusive GVCs” which examines measures to strengthen the participation of small and medium sized enterprises in GVCs. 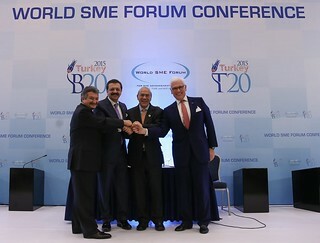 The creation of the World SME Forum is another important milestone. Continuity in efforts by the B20 – and indeed the G20 – to enable SMEs to make their best contribution to investment, employment, innovation and prosperity is critical for getting the “biggest bang for our collective buck”. We cannot afford to reinvent the wheel or duplicate efforts. Furthermore, we must keep SMEs on centre stage for policy makers – the important achievements of 2015 cannot be “one-off”, and efforts must continue to give SMEs a voice in global policy making. It will not be easy – the ambitions of the WSF are commensurate with the challenges that SMEs continue to face, from regulatory and trade barriers to anti-competitive practices, from lack of skills to tight financing conditions, from deficient infrastructures to poor access to knowledge networks and technology. The involvement of the private sector is critical to developing and implementing credible and relevant SME policies, and creating a level playing field for these firms. The World SME Forum will be an important linchpin in these efforts, and the OECD is honoured to join forces with the WSF as an Institutional Partner. We see important synergies between the OECD’s work on SMEs and the agenda of the WSF. On issues such as SME financing, global value chains, SME benchmarking, innovation, digitisation, statistics, and other shared priorities, we are ready to leverage our analytical capacities and expertise in support for implementation, as well as our networks of policy makers and private sector stakeholders. By joining forces, the OECD and WSF - along with other partners - can help foster SMEs’ contributions to inclusive and sustainable economies. Together, we can make a difference for SMEs and help improve the wellbeing of the millions of people who depend on them.